Heaven is a place where you can kiteboard from 10am to 4pm, then grab a beer while watching the sunset on soft white sand beaches, get to feast on exquisite lobster and shrimp for cheap, party the night away and get to do it all over again the next day. Such a place does exist on this good earth and its called Cabarete and is situated in on the north coast of the Dominican Republic. 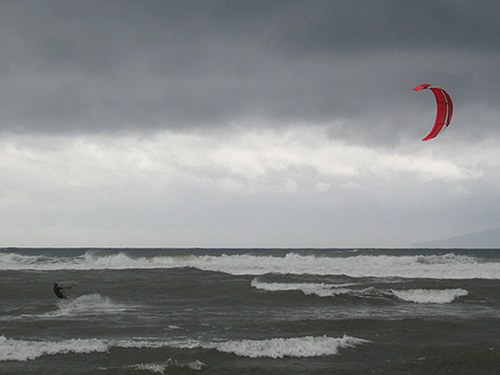 Cabarete kiteboarding lessons are some of the cheapest in the world. This combined with a great night life makes this one spot I recommend to all beginners. In Cabarete you can easily enjoy a vacation, take a large number of lessons and buy a kite a for the same cost as just taking kiteboarding lessons in the US. The wind is what we all come for. Around 1pm it kicks in and the whole town comes to life on the water. During most of the year 60% of the days or more are kiteable. Best months: Jan to Jun-July. Its usually around 15-22+ mph. There are many, many kiteboarding schools which offer one of the most affordable introductions to kiteboarding on the planet. KiteExcite, SkyRiders are some examples. The large number of schools means that you can usually get a very good price. A great thing about Cabarete is that there is a huge number of things to do if the wind is not blowing. Lagoon trips and much much more. Bars/Clubs – there are quite a number of bars here. Even one irisih pub. The clubs play anything from regaetton to hip-hop and that too very very loud. Restaurants - amazingly you can find very good restaurants here because of the large number of expatriates. The local cuisine is also very good. There are many options from really expensive to the really cheap. From 60 dollars a night to more than 400 a night for expensive options. Visa Restrictions: These might have changed but if you have a Greencard or if you are a US citizen then you can get a visa on arrival. Please check your nearest Dominican Republic consulate for more information. For kiteboarders going upwind is the skill that marks the end of being a beginner and finally being able to try those big jumps. However this is one of the skills that beginners find the most difficult. First start going slightly downwind on a broad reach till you pick up a little speed. When you have gained a little speed, dig in the heel side edge of your board and turn your body to look at a point about 30 degrees upwind from the direction you are headed. Your head and your shoulders should be squared to the upwind point. As your head turns so should your board. It should be pointed slightly ahead of your intended point. Its very important to keep the board between you and the kite. Move the kite in a small sine wave so that you can “feel” the changes in wind direction and speed. As and when you feel the wind change, adjust the direction of the board. If the wind lessens or if it veers toward the direction that your traveling then point your board slightly downwind – this will compensate for the slower pull of the wind. If the wind picks up or it starts blowing away from the direction of travel then you can edge the board harder to maintain your speed. These shifts in wind are called “headers”. You’ll soon realise that you can use the gusts of wind to go upwind at a steeper angle. Both your legs should be slightly bent and your upper body should be pointing towards the upwind point your trying to get to. Also, you should be going slower than when your going on a broad reach. Soon you’ll realise that going upwind is all about using these wind shifts so that you are moving upwind most of the time. With practice your ability to keep the kite and you moving upwind will increase. Its all a matter of continously checking your direction and making changes on your board direction as the wind changes – ie in gusts you point the board more up wind and in lulls you point the board slightly less upwind. When starting out you should really exaggerate squaring up yours shoulders to the upwind body. This is the key to being able to go upwind. After learning to go upwind, you’ll be ready to jump which will make you even more addicted to kiteboarding. As I kept swimming the kevlar lines twisted tighter and tighter around my leg. I imagined a sudden gust tightening the lines and cutting off my leg at my ankle. As the thought passed through my head, I immediately swam towards my fallen kite as fast as I could and deflated the leading edge. Now all I had to do was swim 200 meters to the shore with 16m-square of plastic connected to me. No problem. Such events, which usually take place when your trying to kiteboard alone in a new environment, are known in the kiteboarding community as KiteMares. I’ve had a few interesting ones to say the least. Some where I didnt know the extreme danger I had escaped, till I got back to shore and then looked back at where I had been. not having properly practiced self-rescue. A lot of people dont spend enough time understanding self rescue so when they find themselves in a bad situation, they dont know what to do. not having taken the time to think what you would do in a bad situation. Are you willing to let go of the kite if your life depended on it? Dont go out if you the wind is faster than what your comfortable with. This bears repeating even though its common sense. Dont let peer pressure or over-confidence ruin the rest of your life. Make sure you’ve done self-rescue simulations in the water at least 3 to 4 times with a friend on shore to help. Make sure you keep repeating till you need no help from your friend to get yourself, your kite and your board to shore. Check the weather forecast for the entire time you’ll be on the water. Note the tides, the water temperature, probable gustiness of the wind, possibility of a storm hitting and the possible direction it will come from. Understand the local weather (depth at low and high tides) and lay of the land/water (submerged hazards, local currents, shallows) from the local kiteboarders/sailers/windsurfers. Kite with a buddy. This really helps if your compadre is more experienced than you and applies this to help you in your endeavor to get better. Test your safety releases before you start kiteboarding. This takes 2 minutes and could save your life. Regularly change your lines and heck lines for knots. Go over in your mind and convince yourself that the kite is replaceable but YOU are not. Learning to kiteboard can be hard but its all in your mind. Just like everything else . The best way to get started kiteboarding is to take a beginner lesson at a local kitesurfing school. Please read this article on What To Do Before Your First Kitesurfing Lesson to learn how you can save money on a beginner kitesurfing lesson by preparing for it before hand. Lessons are not cheap and reading that article could save you the cost of extra lessons (ie, at least $200). Not a bad deal for 15 minutes of your time! When should I think of buying gear? You should only think of buying gear after your first lesson and after you feel this sport is for you. Kiteboarding equipment is expensive so make sure you understand what your buying. I will write a separate blog post on what equipment to buy. What should I do after the lesson? Most kiteboarding schools will offer a service in which they will take you out to kiteboard at a nice shallow spot where they will keep an eye on you while you practice your new sport. This will be usually much cheaper than a lesson and will usually involve them helping you out when you get into trouble (eg: if the wind dies and your in the middle of the bay, or if one of your lines break etc). I would highly recommend you taking advantage of such a supervised type of situation. If the above is not available then you should try to get a bunch of people together so that you can split the cost of a rescue boat or find a spot where its very shallow and you can practice without fear of not being able to make it back when the wind dies. Always make sure that the wind is side shore or side on shore so that in the worst case scenario, you can drop your kite and it will float back to the beach. Generally you want to buy a stable kite which is easily re-launchable and forgiving in gusty conditions. For a board, you want some with a lot of surface area as these are more stable and easier to balance against the pull of a kite. I have 2 waroos which is also one of the cheaper kites on the market. How can I make sure I am safe while kitesurfing? The most important part that schools omit when you learn to kiteboard is the psychological mindset that you need when your learning to kitebaord. I’ve seen many kiteboarders buy expensive gear and take a lot of lessons and then, on the first day that they kiteboard on their own, they realise how dangerous kiteboarding can actually get and quit the sport. Kiteboarding is dangerous. You need to accept that before you can become a real kiteboarder. The only way to accept that is if you realise that there are a lot of variables that affect your safety when you kitesurf and the way to stay safe is to keep those variables within the bounds that you are comfortable with. Weather conditions. If its windier than 22 mph then dont go out. Dont go out if its more than your comfortable with. If the wind is blowing offshore then dont go out. Location of the kitesurfing spot: The ocean will have a bigger waves and you will have to self rescue yourself back to shore if the wind dies as your feet wont be able to touch the floor. However in a shallow bay, you’d have the option to literally walk back to shore if the wind dies. Gear. Check your safety release each time before you go out. Make sure it works! And dont forget to reset it after you;ve tested it. Make sure your lines are all okay and dont have knots and arent strayed from excessive use. Protective Gear: Wear a helmet to protect your head and an impact vest to protect your torso. Number of people around to help you in case of a problem. Always go out kiting with a friend. If you cant find anyone to go with then dont go out. Stay safe and good winds! Kitesurfing, in most situations, is a safe sport. Having said that, its not possible to predict the weather and calm situations can become dangerous very quickly. And if your not careful, yes it can kill you. But so can snowboarding, diving, whitewater kayaking and other extreme sports. Extreme sports are named as such because of that inherent danger. And that inherent danger part of the reason why its so much fun . By following a few rules you can make kitesurfing (kiteboarding) as safe as windsurfing in my opinion. 1. Check the weather forecast beforehand and at the beach to get an idea of how windy its going to be during your whole session. If its blowing 22 or more then do NOT GO OUT. Literally, do not go out on to the water if your feeling even a little scared. Wait till you get better at the sport. And if its below 13 then dont go out because all you will do is drop the kite in the water and then have to self rescue as relaunching a kite in light wind is very difficult to do. 2. Check your chicken-loop’s safety release everytime before you go out. And always wear a leash so that your kite is always attached to you even after you pull your chicken loop’s quick release. 3. Always kite with a friend. 4. Write your name and address and phone number on your kite and board so that if you ditch your kite and board then rescue personell can try to contact you before they launch a rescue. 5. DO NOT use a board leash. Google for “board leash injuries to understand why”. 6. Wear a helmet and a PFD/impact vest. 7. Get in shape. 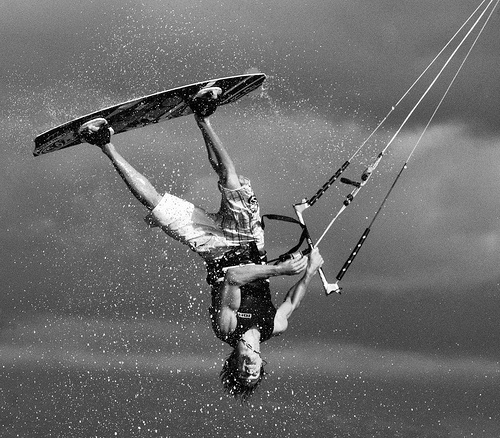 Being in shape will give you the stamina and strength to get out of messy situations while kiteboarding. Most injuries happen when you get tired on the water. Workout so you can minimize this happening to you. Why are Kiteboarding Lessons important? Kiteboarding can kill you if you dont know what your doing. Always, ALWAYS, always, always take a beginner kiteboarding lesson when first learning how to kiteboard. 5. Control the boat after you’ve fallen off your board. As a beginner, 99% of your time will be spent in just figuring out how to just get on the board itself. Ie, you would be lucky to just do item number 2 listed above and you can forget about doing anything else. Now imagine yourself falling off the board (but still attached to the boat) and losing control of the boat while its charging at the shore at 40mph. 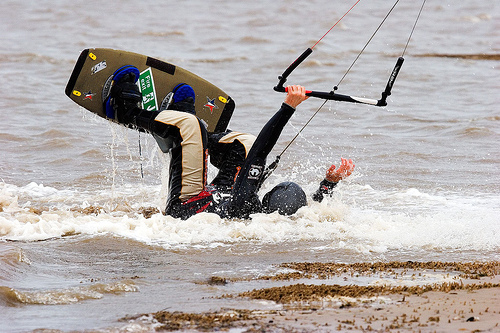 This is how dangerous kiteboarding can be if your a rank beginner. Not a pretty scenario, right? Thats why I implore everyone who reads this blog to take a lesson when your beginning kiteboarding. Understand and practice self rescue. So please go take a lesson. 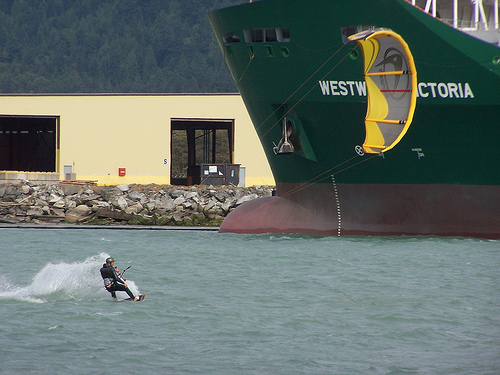 Sometimes I feel that kiteboarding should have licensing rules like cars and boats do. This blog has some good information about kiteboarding but is no substitute for a kiteboarding lesson. If you read the information in this blog first then you’ll get much more out of your lesson and even minimize the number of lessons you will need to take to start kiteboarding. Be safe and may the wind be with you. When your hurrying over to the beach to catch the wind, its easy to forget some of the gear in your haste. This little checklist is prioritized so that the importance of an item is proportional to its place in the list. Print it out and keep it in your kitebag. Gatorade to stave off cramps. Kiteboarding is the fastest growing sport in the world. It’s a combination of windsurfing, surfing and kite flying. It also has elements of snowboarding and wakeboarding. There is literally no feeling quite like kiteboarding on the ocean. Kiteboarding is characterized by a rider whose feet are on a surf-board/kiteboard while being pulled by a kite in the air. He is connected to the kite by 25ft kevlar lines which hook into a harness. The board allows the rider to firstly, control his/her direction of travel and secondly, to manipulate the power generated by the kite. 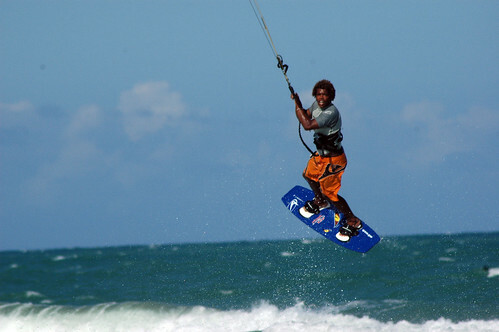 What is the required fitness level for kiteboarding? If you can run 4k in one go, swim a 100 meters without getting winded and if you are comfortable in open water then I think you will find it easy to kiteboard. I’ve seen kiteboarders of all weights and ages. Due to the large amount of power generated by a kite, in my honest opinion, the sport is more about technique than fitness. However if you find yourself in a dangerous situation then athletic fitness will definitely help. If you read the above articles, do what they say and are in good athletic shape then I dare say that you’ll be able to get going on a kiteboard by the end of your first set of lessons. Most people will require quite a few more lessons to get on the board. You can kitesurf literally anywhere that you have side-shore wind and water. Some beaches do restrict kiteboarding and you should check with your local beaches if they allow it. The easiest way to find out kite-able beaches is to find your local kiteboarding shop and ask them. KitesurfingSchool.com has a good list of all kiteboarding schools that you can start with. Otherwise google is your friend. Some schools will, for a fee, ferry you to a location where you can practice your kiteboarding skills and help you out if you get into trouble. This is very useful if you are just starting to learn and you dont have complete faith in your ability to rescue yourself. How much does it cost to get started kitesurfing? Accessories that you may need depending on where you live include a wetsuit, a pfd, a helmet, a rashguard and waterproof glasses. You can get kitted out for a second hand kiteboarding set from $600 to $800. I would say that kiteboarding is initially, a little more expensive that snowboarding but cheaper in the long run. This is because you dont have to pay for lift tickets again and again and again . How much time does it take to learn kitesurfing? Learning to kiteboard is controlled more by external factors than anything that has to do with you. Namely, the weather, the quality of the instructor, the equipment etc. My article on waterstarting will give you an idea of how these factors will affect your learning. If you account for all of the above external factors then I would say it will take about 12 hours of lessons on average to be able to get up on the board. Now this will vary depending on your athletic ability, your knowledge for other board sports and as stated before the weather conditions etc. Lots of kiteboarding schools advertise that you only need 9 hours to learn how to kiteboard. What they actually mean is thats the minimum time to get to a point where you can stay on the board for about 4 seconds is with 9 hours of lessons . Bottom Line: If you can minimize the external factors then you can minimize the number of hours of lessons you need to learn to kiteboard. How is kiteboarding different from kitesurfing? Kitesurfing is now usually reserved for describing kiteboarding with a surf board and usually only for cases where there are waves involved. This is not a 100% strict rule and some people do use it when talking about regular kiteboarding. Why is it so difficult to waterstart for a kiteboarding beginner? You’ve been taking lessons for kiteboarding and your finding it hard to water start. Your now at the point where you are thinking of just giving up.Well DONT! In 90% of the cases that I’ve seen, the reason someone has not been able to waterstart is due to external factors. ITS REALLY NOT YOU. Wind speed should be between 14mph and 21mph. Any more and you will get blown off the board. Wind direction should be side shore or side on-shore. No or little chop in the water. The more choppy the water, the more difficult it will be to put the board on while keeping the kite in its zenith position. You should have the newest LEI kite available either of that same seasons model or the next seasons model. You should have a nice wide board which will make it easier to balance once your up and going. A handle in the middle of the board also makes it easier to hold while your trying to balance the kite. The instructor should be near you preferably on a jet ski. In Maui, Hawaii this is not possible due to the beach laws but in any case learning in Hawaii is hard and not recommended for a beginner. If the instructor is on a jet ski then this also means that you dont have to keep going back upwind via the beach. This will give you more time to practice your waterstart. No current in the water. If there is a current in the water then this will either “add” to the power of the wind or “take away” from the power of the wind depending on whether the current is in the same direction as the wind on not. This essentially will confuse a beginner. If this helps even one other beginner from the same scenario I’ll be very happy. If your thinking of taking a lesson you might want to review my 7 Things To Do Before A Kiteboarding Lesson. A trainer kite is a small foil kite on which you can practice your kite flying skills. Roughly 50% of the skill of kiteboarding is to do with being able to fly the kite to whatever position you want it to go with minimum effort. The other 50% is board-skills, ie, learning how you can adjust the board to change the direction in which your heading and to control the power of the kite. By practicing the different trainer-kite exercises you will familiarize yourself on how a 4 line kite will act and how you can control it. Plus, its a lot of fun! Bar Control – How to use the bar to control the direction and pull of the kite. This includes learning where your hands should be placed on the bar for maximum effect. Understanding the wind window. You will get acquainted to the different parts of the wind window. Understanding this is CRUCIAL to the sport. Self Launching your kite. The method used to self launch a small trainer kite is similar to the one used for larger kites. If you learn how to do this then you do not have to be dependent on other people to help you launch and land your kite. Understanding how to use the wrist leash. Some trainer kites come with a wrist leash which will help you understand how its used to make kitesurfing safer.Understanding how the leash works could mean the difference between losing and saving your $1000 kite. Being able to control the kite without looking at it and with one hand. This is a very necessary skill later as you will need your other hand to hold your board when you step into it. And after your done with the beginner kite you can give it to your girl/boy friend so that he/she has something to do on the beach while your off kite-surfing. 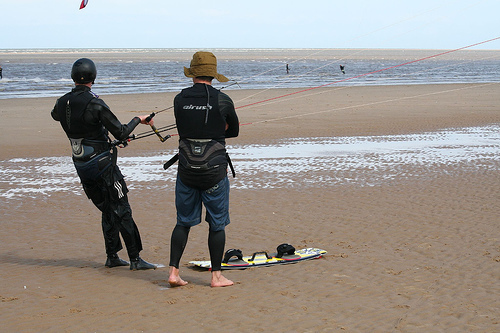 When you start kitesurfing, your friends can use the trainer to kickstart their kitesurfing learning. This video is a great video which tells you how to use and learn with a trainer kite. 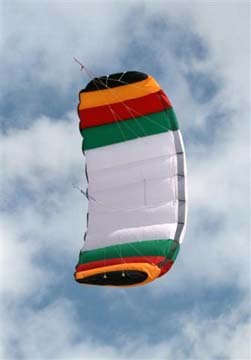 The kite featured in the video is also a good buy because its easy to self launch. There are many different varieties of trainer kites. Make sure you buy one which has a bar and NOT handles. 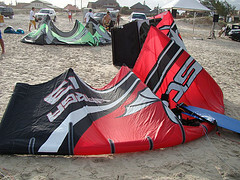 All the kites that you will ride while kiteboarding come with a bar and its imperative you understand how to use one. Some trainer kites can be used as snow kites in winter. These will be a little more expensive. I would not spend more than $100 – $120 on a NEW trainer kite. I bought the blue 2m Slingshot kite pictured on the right above. Have a look on KiteForum and Craigslist for a used trainer kite. If you have the money and would like to buy a small version of an LEI kite that you will actually use during kiteboarding then you may be interested in OCEAN RODEO RISE SLE 2 METER KITEBOARDING TRAINER KITE . This kite will allow you to practice launching, rigging, flying something thats very very close to an actual traction kite thats used in kiteboarding. If you have the money then this kite will give an idea of all complications that come with a 4 line kite which a 2 line kite cannot. Be able to comfortably control the kite and keep it at its zenith with just one hand. Keep your hands in the middle of the bar for better control. When comfortable use only one hand. Practice with both left and right hands. Move the kite in a figure of 8 through left and right side of the wind-window with your eyes closed. First do this with both eyes open and with both hands on the bar. Then do it with one eye open. Then with both eyes closed and finally with both eyes closed and just one hand. (This is difficult :). Self launch the kite. There a lot of videos on you tube which will show you how to self launch the kite. This is a very important skill to learn as you will need it when you want to go kiteboarding alone. Use the power of the kite to pull you from a sitting position into a standing position with both hands on the bar. Essentially you should try to simulate the pull that is created when you water start. I will write a separate entry at some point on waterstarting technique but for now you should be able to find something on youtube .